Joshua (Hebrew: יהושע, Yehōshūaʻ; "Name means::YHWH is Salvation") or Joshua, son of Nun (Hebrew: יהושע בן נון, Yehōshūaʻ Ben Nūn; Arabic: يشع بن نون, Yusha‘ ibn Nūn) (ca. Born::2470 AM–fl. Flourit::7 Adar 2553 AM–Died::2580 AM) was the second Judge of Israel, the first commander-in-chief of the army of Israel, and the immediate successor of Moses as Judge. Joshua was an Ephraimite, born in Egypt, likely in 2470 AM, three years before Moses fled to Midianite country after killing an Egyptian. The Chronicler records eight generations between Joshua and his ancestor Ephraim. His full name was Joshua, son of Nun (Hebrew: יהושע בן נון, Yehōshūaʻ Ben Nūn) and he was also known as Hoshea (Hebrew: הושע, Hōshēaʻ; "Name means::Salvation"). Joshua was probably born 179 years after Ephraim was born, thus requiring slightly more than 22 years per generation. The tribe of Judah has definite instances of generations occurring 15 years apart, so this is quite reasonable. 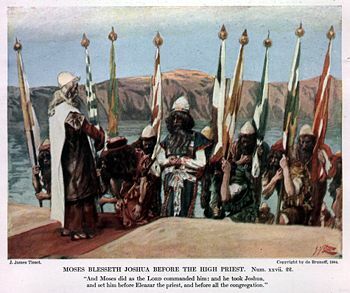 The Israelites observed thirty days of mourning for Moses, and then Joshua ordered the people to prepare to cross the Jordan River after three days. On 10 Abib 2553 AM (15 April 1451 BC), the Israelites crossed the Jordan. Thus began the War of the Conquest of Canaan, which lasted for seven years. This quote, and especially the last sentence, can often be seen on Christian memorabilia and merchandise. The people boasted that they would indeed serve the Lord. Joshua predicted that they would find themselves unable to serve Him faithfully. (Joshua 24:16-28 ) Thousands of years later, the Apostle Paul would remind Christians that they, too, cannot possibly serve God without missing the mark, i.e. sinning, to one extent or another. Joshua died on or about 2580 AM, after living for life span::110 years. He was buried in Timnath-serah, in Ephraimite country. The English name Joshua is a rendering of the Hebrew: יהושע, Yehōshūaʻ meaning "YHWH is Salvation". The Anglicized transliteration of the Greek transliteration of Yehōshūaʻ used in the Septuagint to refer to Joshua is Ίησους, Iēsous or Jesus. Some commentators have thus suggested that Joshua is a type of Christ, and have pointed to the parallel between Joshua's crossing of the Jordan and Jesus' baptism in the Jordan. In addition, they point to the army of Israel marching seven days instead of six around the walls of Jericho, and to John the Baptist citing a memorial that Joshua had erected at the crossing site. Other commentaries point out that Joshua underwent a lifetime of training before he took his leadership position, and see this as a reminder to all persons eager to serve not to be impatient and attempt a mission for which they are not trained. Many scholars dispute the historical accuracy of the book of Joshua, which is the most important source for Joshua's career. Most authorities accept the idea that Joshua lived and fought his battles during the Late Bronze Age. This period is classicaly thought to last from 1400 BC to 1200 BC. Recent archaeological findings at Jericho have served to provide better support for the Biblical narrative. Landmarks in the Biblical Chronology. Long sojourn aligned with the revised Egyptian Chronology (Egyptian History) as per David Down. Some adjustments for co-regency in the 12th dynasty. Pharaohs of Egypt shown where there is good archaeological evidence to support the synchronism with the Biblical time line. An approximate timeline showing the Israelite Sojourn and the relationship to the various dynasties of Egypt. ↑ 2.0 2.1 2.2 2.3 2.4 2.5 2.6 Blank, Wayne, "Joshua," Daily Bible Study, n.d. Accessed December 15, 2008. ↑ 3.0 3.1 3.2 3.3 3.4 3.5 Shyovitz D, "Joshua," Jewish Virtual Library, 2008. Accessed December 14, 2008. ↑ 4.0 4.1 4.2 4.3 Konig G, "Joshua," AboutBibleProphecy.com, 2001. Accessed December 15, 2008. ↑ 5.0 5.1 5.2 "Joshua," SparkNotes, n.d. Accessed December 15, 2008. ↑ Josephus, Antiquities, 5.1.19,23. Cited in Jones, op. cit., p. 90. ↑ Missler C, "The Conquering Hero - Joshua," Koinonia House Online, 1996. Accessed December 15, 2008. ↑ Sullivan D, "Biblical Lives to Live By: Joshua," Evangel Baptist Church, n.d. Accessed December 15, 2008. "Joshua." Old Testament Gateway, Tabor College, Victoria, Australia. Contains multiple links to various essays about Joshua and his times and to various English and Hebrew manuscripts of the Book of Joshua. This page was last modified on 13 February 2014, at 08:55.